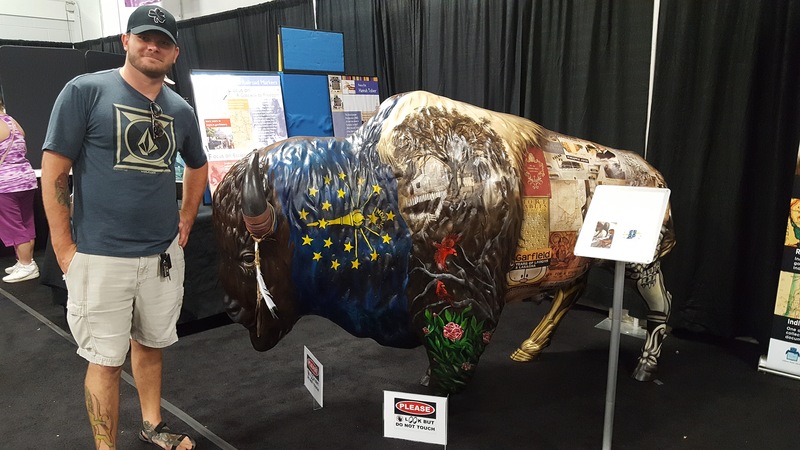 The Indiana Association of United Ways developed and coordinated a unique, statewide public art display titled, “Bison-Tennial Art Project” during Indiana’s bicentennial. 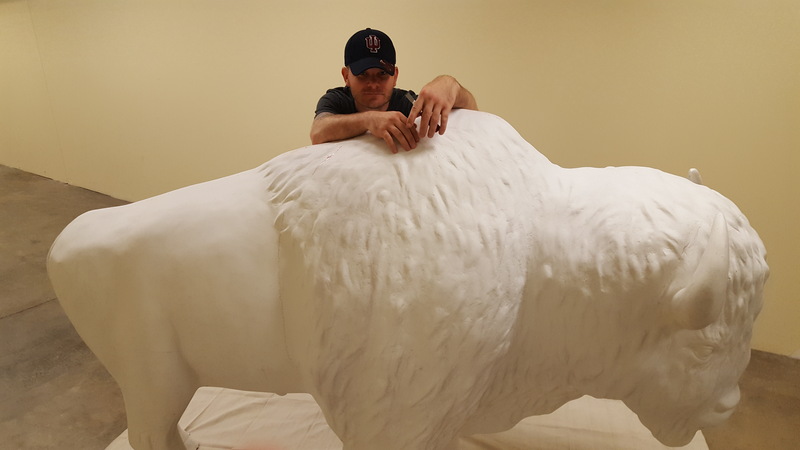 As a nod to the Indiana State Seal, over 100 fiberglass bison, measuring 5-feet tall and weighing approximately 100 lbs. were created for artists to capture local and state-wide history. 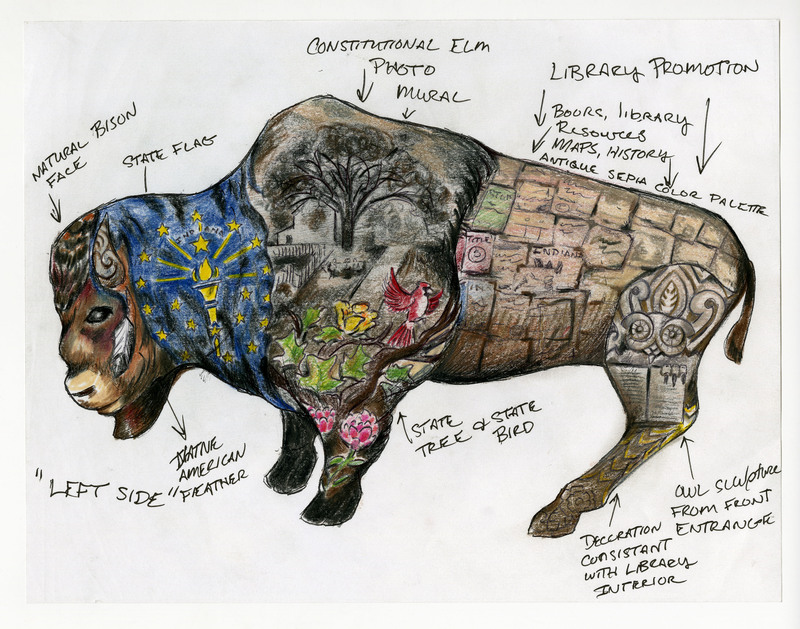 In early 2016, the Indiana State Library Foundation sponsored a bison for the library. “We are excited to be a part of such a unique opportunity to showcase the library’s collection and dedication to preserving Indiana history in such a fun manner. Troy [the artist] did an amazing job of blending collection items, Indiana State Library building symbols, and Indiana history. His vision was perfect for our library and he is a truly gifted artist,” stated Connie Bruder, Associate Director of Public Services. Library staff held an internal competition to name the bison and after two rounds of voting, “Cookie” was chosen unanimously. Christy Franzman, Young Readers Center Librarian, suggested the name to commemorate Indiana’s first State Librarian, John Cook (1841-1844). Library administration released a request for proposals to local artists and received five submissions. On May 10, 2016, Troy Fiechter (FEEK-ter) was commissioned to complete “Cookie” by the end of July 2016. Fiechter, a native Hoosier, previously studied and works in a variety of media. He proudly served as a Combat Veteran of the Iraq and Afghanistan campaigns and is currently employed as an Automation Specialist at Progress Rail Services in Muncie, Indiana. The artwork and imagery on “Cookie” is representative of Indiana’s history, the library’s collection, and architecture found within the historic building. 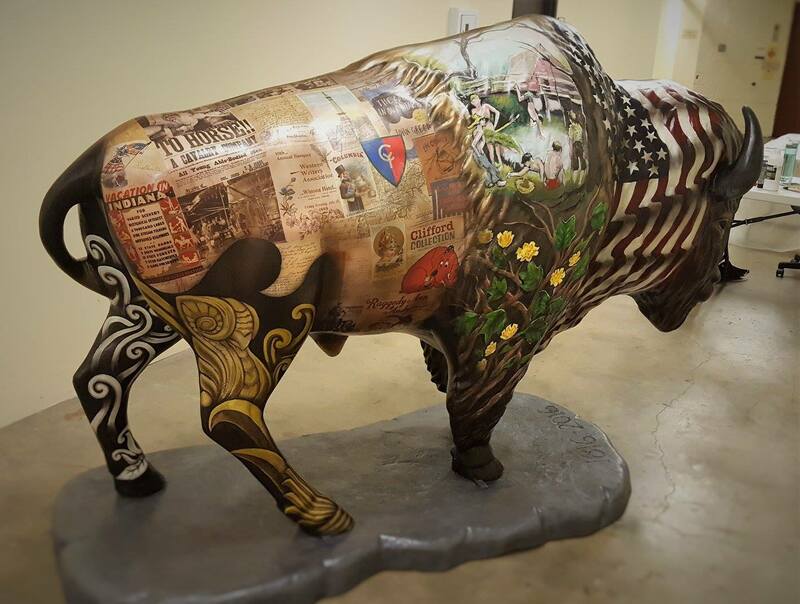 The bison’s head and neck are covered with the American flag and the State flag of Indiana. A mural of the Corydon, Indiana ‘Constitutional Elm’ is located on the left side; James Whitcomb Riley’s book cover of “Poems of Childhood” can be found on the right side. Below each mural are symbols of Indiana, including the state bird, flower, and tree. Staff from Genealogy, Indiana, Reference, and Rare Books and Manuscripts Divisions provided over 140 digitized items for the proposed decoupage on its mid-section. Bethany Fiechter, Rare Books and Manuscripts Supervisor, selected and edited over 50 digitized photographs, newspaper clippings, and documents. The hind legs are covered with the iconic limestone and brass owls found on the exterior and interior of the State Library, a building listed on the National Register of Historic Places. Troy and Bethany, husband and wife, worked a total of 120 hours on the project. “Cookie” was painted with acrylic, airbrushed with an ink/dye mixture, and varnished using a matte, water-based polyurethane. After a brief appearance at the Indiana State Fair, “Cookie” will be on permanent display in the Education Center of the Indiana State Library. 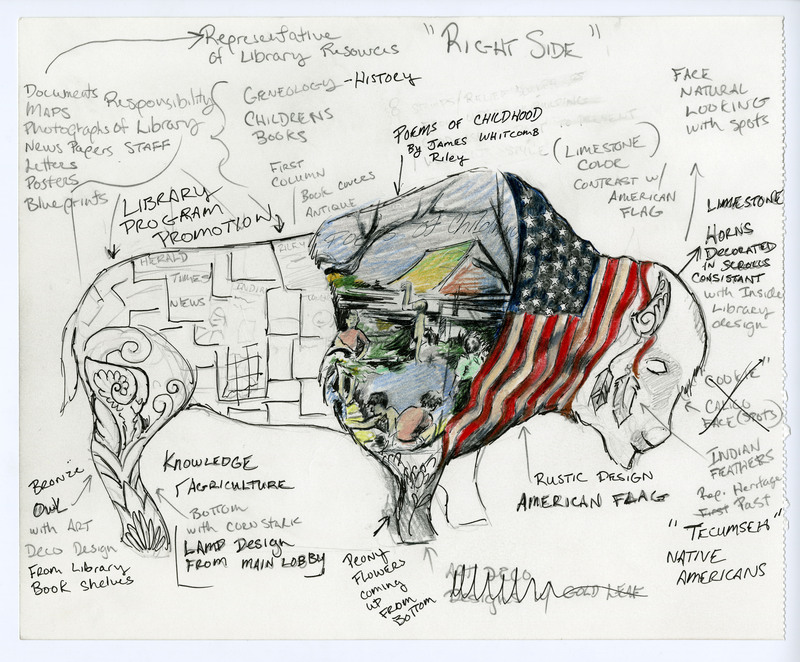 For more information on the “Bison-tennial Public Art Project,” follow the hashtag: #IndianaBisonArt or #Indiana2016.